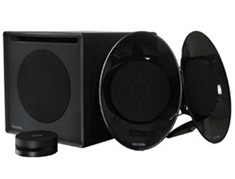 Powerful high fidelity 2.1 subwoofer speaker system with HC2D (High Clarity Close Distance) technology. HC2D reproduce uncoloured frequencies with optimum power, thus you get the best full range sound with minimum distortion. Powerful subwoofer with built-in amplifier that gives you unprecedented vocal and depth in bass frequencies. Amplifier with intelligent Digital Signal processor (DSP) technology for clearer sound and minimum distortion in sound reproduction. Unique satellite designed without traditional box enclosure, featuring exposed basket, spider and magnetically shielded magnet case. Wireless RF remote control with circular volume turntable knob for complete level controls.